Technology is a significant part of retail and the introduction of new technologies like GDSN are helping retailers streamline their business operations. But is this just a new technical evolution, or these terms really mean something to your business? In a business scenario, all enterprises strive to improve their efficiencies and maximise the return on their resources. Many companies realised that they could save time, reduce errors by standardising and networking their product data. Every company maintains a database with information about the products they make, sell or buy. This master data is shared with all the trading partners, including manufacturers with whom the retailer does business. Companies merge the data received from various manufacturers or suppliers in order to create their own master data. Business runs smoothly as long as the data between both, the retailer and the trading partners matches 100 per cent. But if the retailer needs to change any information in their master data, it can lead to problem unless the change is updated quickly in the master data and communicated to all the partners. Global Data Synchronisation Network (GDSN) therefore, assures that data exchanged between trading partners is accurate and veracious with universally supported standards. Essentially, GDSN network connects subscribing trading partners to the GDSN certified interoperable data pool which in turn are connected to the GS1 Global Registry. GDSN enables the registration and publication of product information by providing a global repository for standardised item, location and trading partner data. Suppliers send data to GSDN via chosen data pool. The data pool then checks the data for compliance to GS1 standards and validates it with demand side partners via the GS1 Global Registry, ensuring that all the trading partners are using the identical, updated standards-complaint data. According to Rachna Nath, Executive Director, PricewaterhouseCoopers, “GDSN is a standard based, automated global environment that enables secure and continuous synchronisation of product information between trading partners. There are three important components of GDSN. 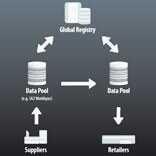 GS1 Global Registry: Allows suppliers using GDS to register their product information and share with retailers using a ‘data pool’; Ensures uniqueness of the product information and party. GDSN Standards: Common language of electronic identification and communication. Data Pools: Electronic catalogues of standardised item data; Serve as a source and/or a recipient of master data.” GS1 Global registry acts as a ‘yellow page’ directory. GDSN compliance is important as it allows for effective standards-based trade with suppliers who use GDSN complaint data pools. In India, GDSN is at a nascent stage, several leading retailers are showing interest in standardisation. According to Nath, “Retailers understand the importance of standardisation and the kind of savings that can be generated; that said, at this time, retailers are focused on issues like growth and streamlining of business operations. Since GDSN also involves technological changes (system integration) for building data pools for sharing product information, it calls for additional investment. Nevertheless, standardisation is the way forward for the retail industry. This will help the industry to build a roadmap towards standard data sharing.” Hence the success and failure of an item synchronisation initiative depends on the way the process is implemented. Retailers can benefit a great deal with the application of GDSN. Improved visibility of stock level planning and an enhanced item and order administration will be witnessed with the application. At one end the invoice disputes can be kept at bay while at the other end you have reduced transportation cost, you need fewer administrative personnel and you can plan your space in a better way. Retail shrinkage, an industry hazard is also checked with GDSN. The introduction of new items is quicker and easier and you can also maintain up-to-date and accurate product information for price changes, barcode edits, etc. The application of GDSN poses a win-win situation for a retailer. Despite immense applicability in retail and other areas of the economy, awareness of GDSN technology is still very restrained in India. However, the need and benefit of item synchronisation are clear and apparent. Retailers should move quickly in this opportunity to gain maximum benefits. Proper planning and strategic directions will eventually help in less re-work and greater profitability.